From Asahikawa, a Daisetsuzan national Park is accessible as well as some scenic rural towns such as Higashikawa, Biei and Furano. It's also convenient to travel to the northern and eastern part of Hokkaido from here. The Asahiyama zoo is worth visiting, too. It's one of the most famous zoos in Japan, which is known for exhibiting natural animal behavior from big see- through windows. Staff were really accommodating and kind and the common spaces were very clean and had a great vibe. Also in a convenient location for going to various hiking and sightseeing locations in the area. A fantastic hostel!! Yo was super helpful, recommending all the best places to eat drink and visit in the area and making us feel very welcome! Had a fun stay here and met some great people, I would highly recommend a stay here! The staff was english friendly and helpful with questions about local points of interest. 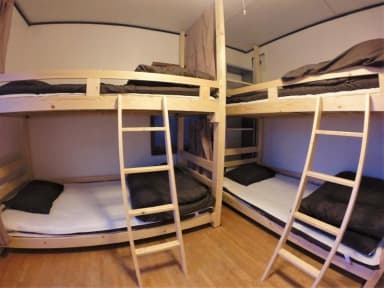 My stay was comfortable despite the size of the 4 bed mixed dorm being on the smaller end. The common space is where you will spend most of the time and has a very welcoming atmosphere. It is unavoidable to get to know people here and I'm happy for that because I met some great people the the few nights I stayed. Also, know that your food will be seasoned because I left salt in the kitchen :). Great people! Youhai also helped a lot finding public transportation and restaurants. Also, we arrive before the check in time but even though he came to open the guest house so we could leave our lagguge there. Not a fancy place but you feel at home. Onwer was really amazing! Very personable and helpful man. Convenient location close to Asahikawayojo Station and a 30-minute walk from Asahikawa Station. Comfortable common area and very homey. Unfortunately, there's only one toilet and shower, and the sink area is small. Overall seems like an old place in need of some updating, but then again 'retro' is in the name, isn't it? 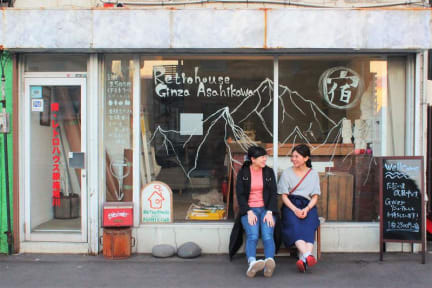 Still a good place to stay for a stopover in Asahikawa.